Upgrade worn out rubber brake lines with stainless steel extended brake lines. 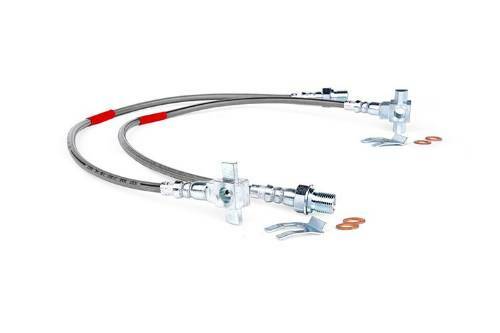 DOT approved brake line kits offer extended length for vehicles with 2"-6" of lift. Stainless steel replacements offer superior protection and longer lifespan. A braided stainless steel exterior keeps lines free from drbris, rocks and mud. This durable outer layer also prevents expansion of the internal Teflon layer keeping fluid moving to the brake line for a firmer brake pedal. Models with less than 4" of lift may have excess slack to keep away from pinch areas.